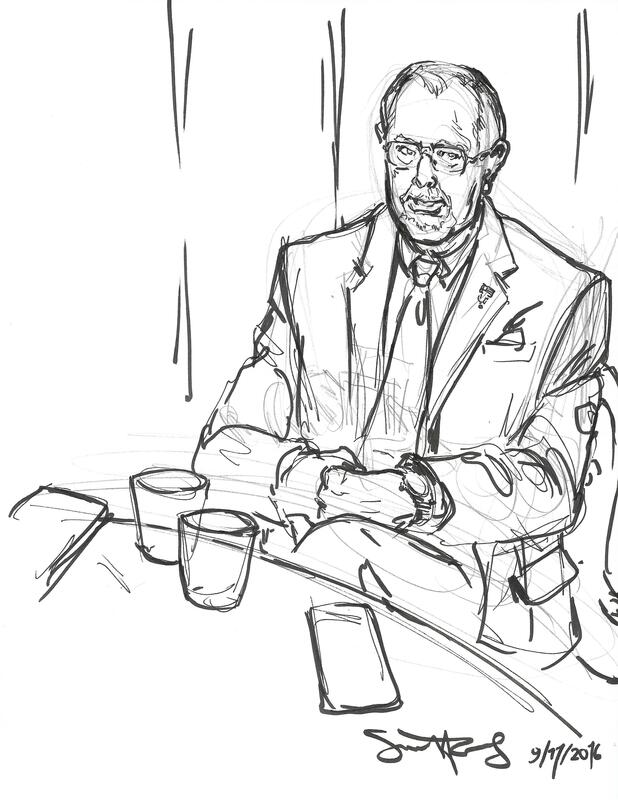 Drawing my husband by candlelight. We went to a birthday party at a really lovely club, only to find that we had missed the party by one night. 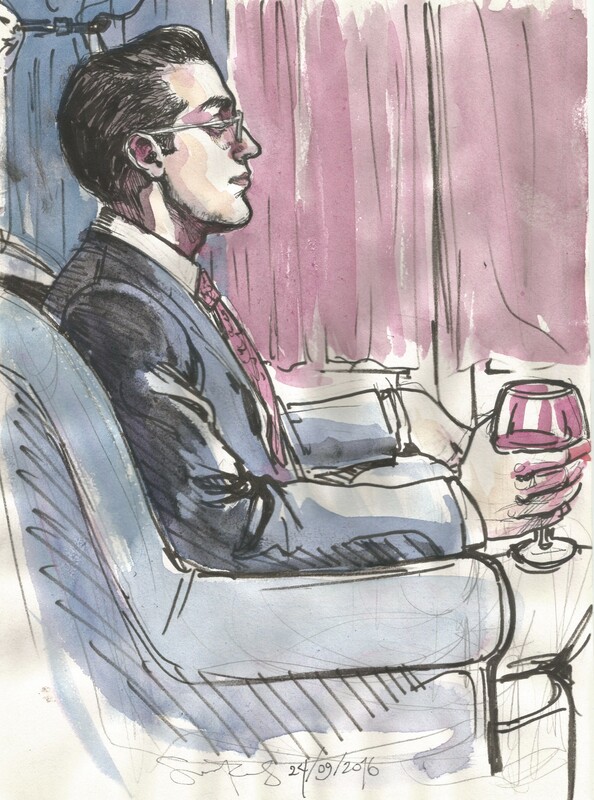 However, there was piano music and candlelight, and I made this pretty drawing of the hubbin, so it was a net win. 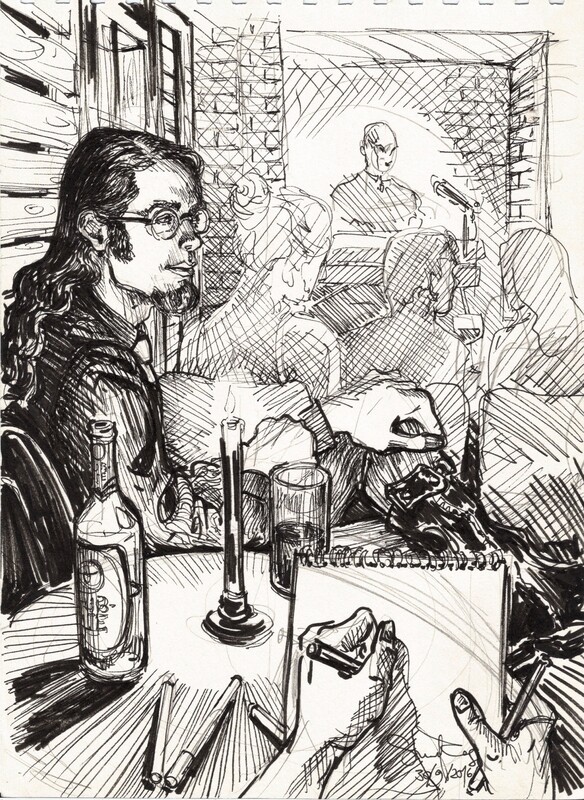 This entry was posted in Berlin, My art and tagged "Glücklich in Berlin", art in berlin, Berlin drawing, drawing, drawing in berlin, life drawing Berlin., live drawing, portrait drawing, Suzanne Forbes, Suzanne Forbes art, traditional portraiture for alternative lifestyles on September 30, 2016 by Suzanne Forbes. 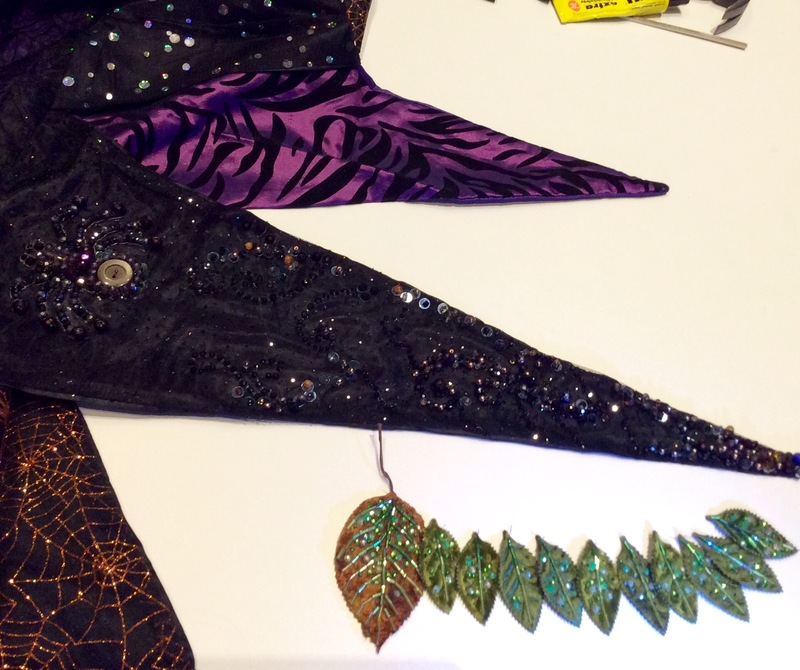 Beadwork in Progress- Halloween crazy quilt mantel scarf and leaf corset. When we got back from the US last week I yanked the box marked “Halloween Craft Projects” off the shelf and tore into it. 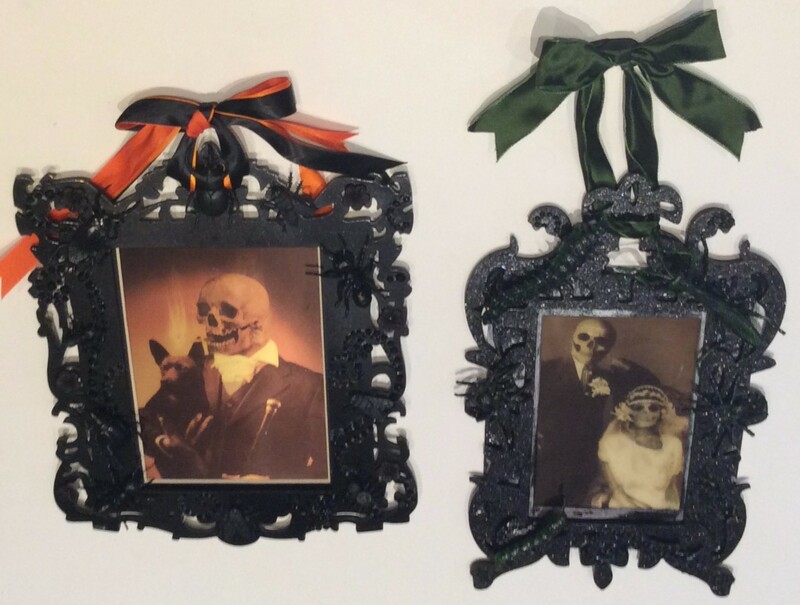 I was basically crazed from exposure to American craft store Halloween displays. 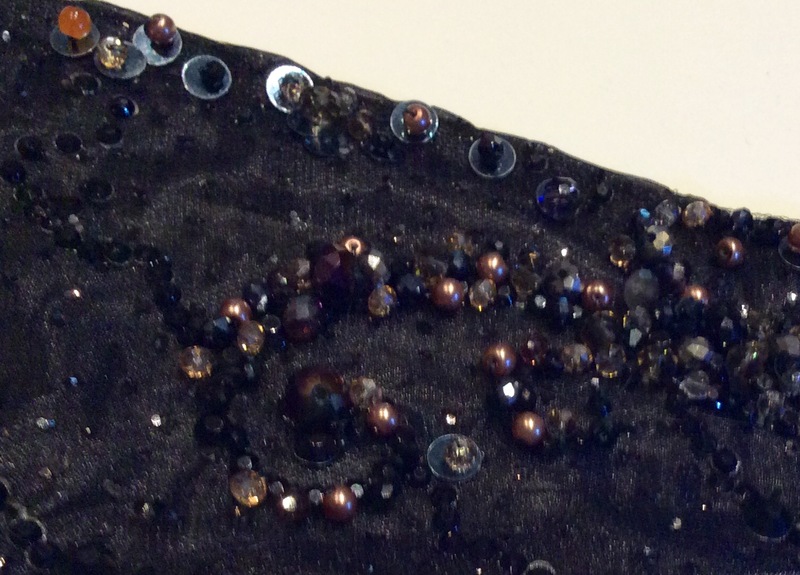 The first thing I wanted to work on was beading this mass-market Halloween mantel scarf or banner that I bought at PierOne during an after-Halloween sale for my usual 75-90% off. This is what I call an “Uplift” project, after the science fiction novels by David Brin. I have never beaded anything as fast in my life as I did this project. I love taking commercially made items that I bought for almost nothing and investing hours of meticulous labor in making them more beautiful. It’s obviously fraught to buy mass-produced items in the first place; I always think of the person who made them. I wonder how my buying these items at the end of their retail life, when they have basically become junk in the eyes of the retailer, impacts the commercial production cycle in other countries of Halloween crap for American consumers. I don’t know the answer, but I do feel a connection when I do this, like my labor and the mystery factory worker’s labor is of equal value. As if by adding hours of my highly trained privileged-artist love-labor to their object of work, I’m giving it more space in the world. A better chance of lasting. As you can see I’ve also been working very slowly on the beaded leaf corset project. I made the perhaps injudicious decision to individually bead some of the velvet leaves. And hand apply glass hotfix rhinestones to them. Heaven only knows how far I’ll go down that rabbithole. I have an Instagram now, where you can see the delightful loot haul of green beads and crystals I recently obtained for the leaf corset! 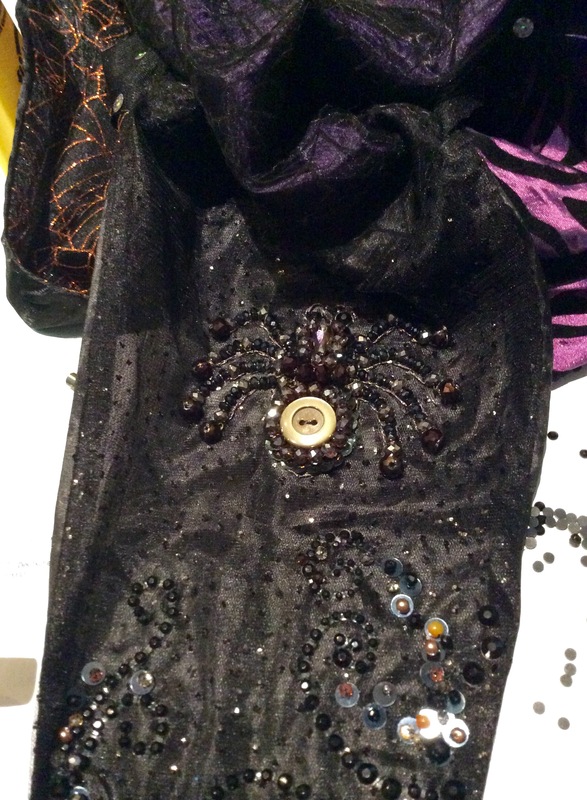 This entry was posted in Embroidery &Mixed Media Art, My art and tagged "modern embroidery", art in berlin, bead embroidery, bricolage, DIY corset, DIY Halloween, embroidered bugs, embroidered corset, Halloween, insect embroidery, mixed media embroidery, modern freehand embroidery, Suzanne Forbes, Suzanne Forbes art, Suzanne Forbes artist on September 30, 2016 by Suzanne Forbes. 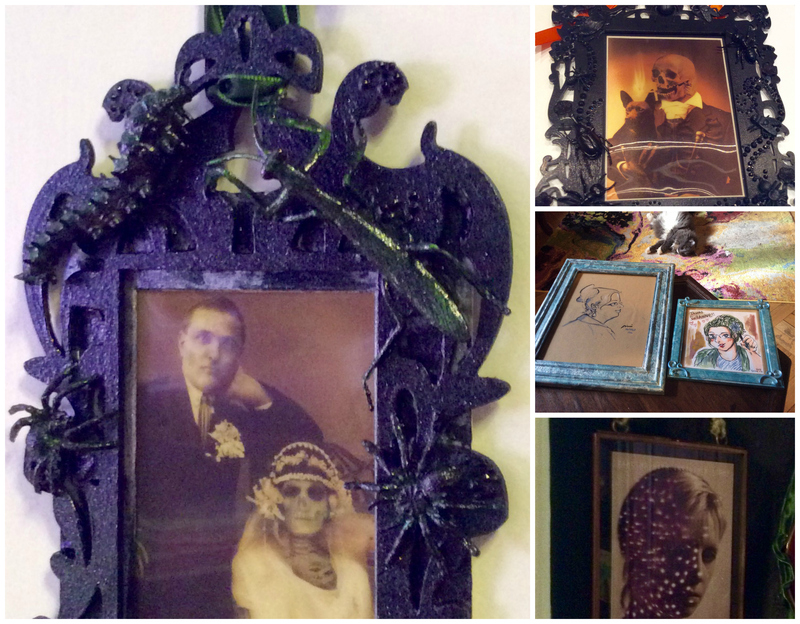 September bricolage roundup- frames and framing! I am always catching up on framing. 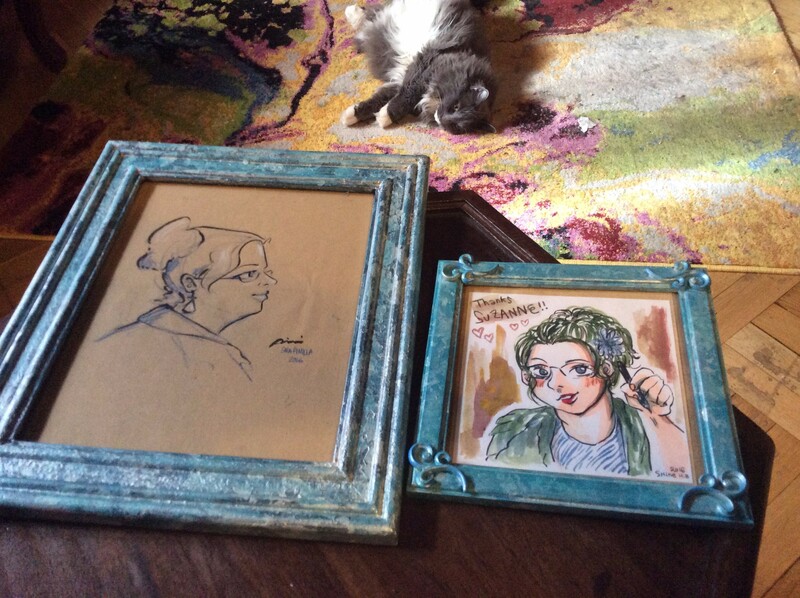 I wanted to frame two of the lovely drawings of me made by young women artists this summer, as well as more creepy dollar store lenticulars I brought from the US for Halloween decor. 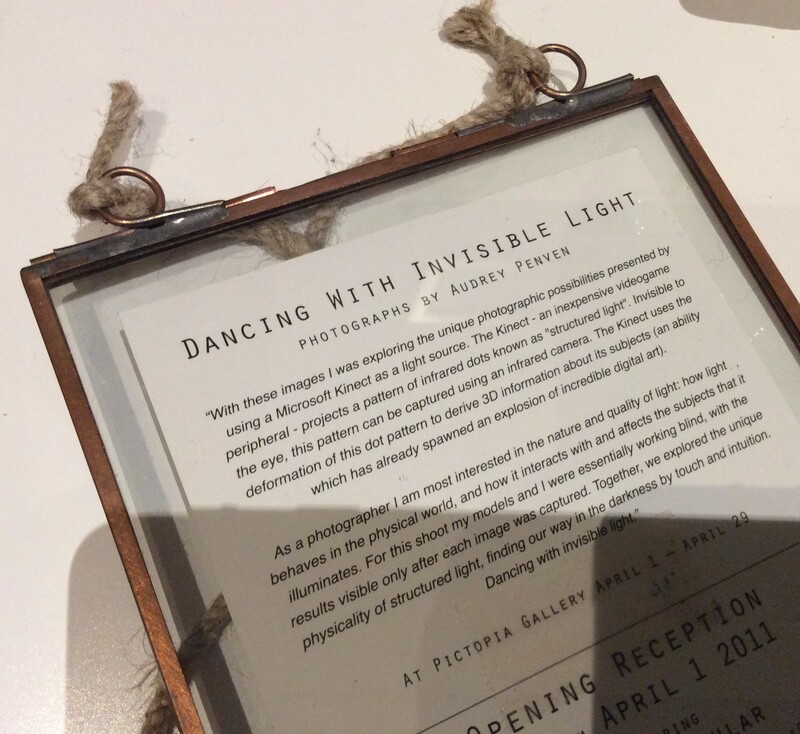 And I finally found a copper frame that was just right for this postcard from beloved friend-muse-Patron Audrey Penven‘s 2011 show. 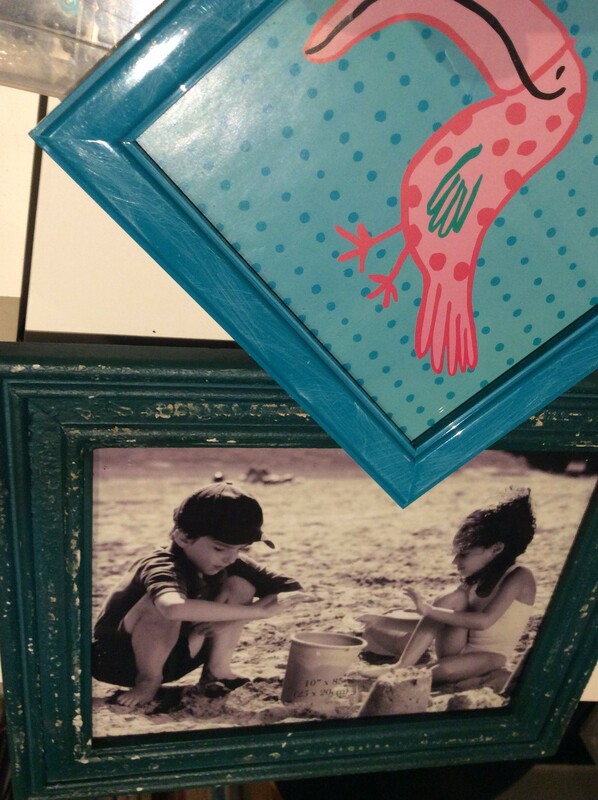 Floating frames are perfect for postcards because you can look at the back as well. For the drawings I bought frames that were blue to start with, since they would be going in the salon. 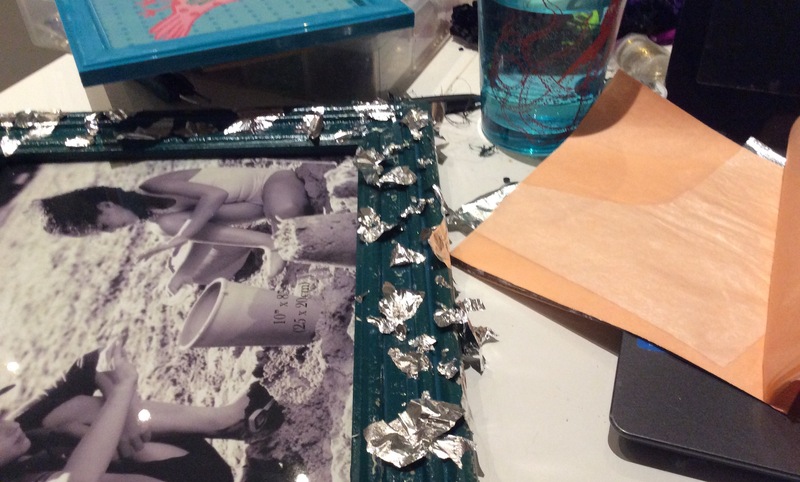 I wanted the frames to be a little more special and integrate with the mostly silver and gold existing frames, so I silver-leafed them. 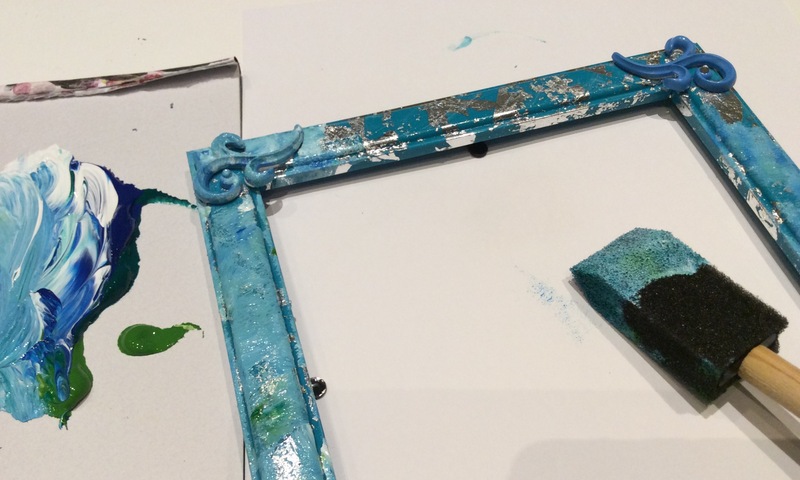 To give the glossy frame a little more tooth on its surface, I scuff-sanded it with a nail file. Then I quickly glazed the frames with some clear polyurethane craft varnish (I was out of my other clear glazing mediums) and stuck bits of silver leaf all over them. My VERY unorthodox method is to then tap and rub the leaf on the still-sticky frame, picking up bits of leaf with my tacky fingertips and tearing the pieces already attached. Once I had a nice pattern of distressed leafing, I mixed up a little acrylic paint and used a sponge brush and my fingertips to roughly add some variegated color that partially obscured the leaf. I found the blue plastic adhesive-backed curleques, made for scrapbooking, when I pulled out the leaf package, so I threw them on there too. More rococo! Once I was done with the painting and the frames were dry, I gave them a thin coat of translucent pearly-gold craft acrylic. 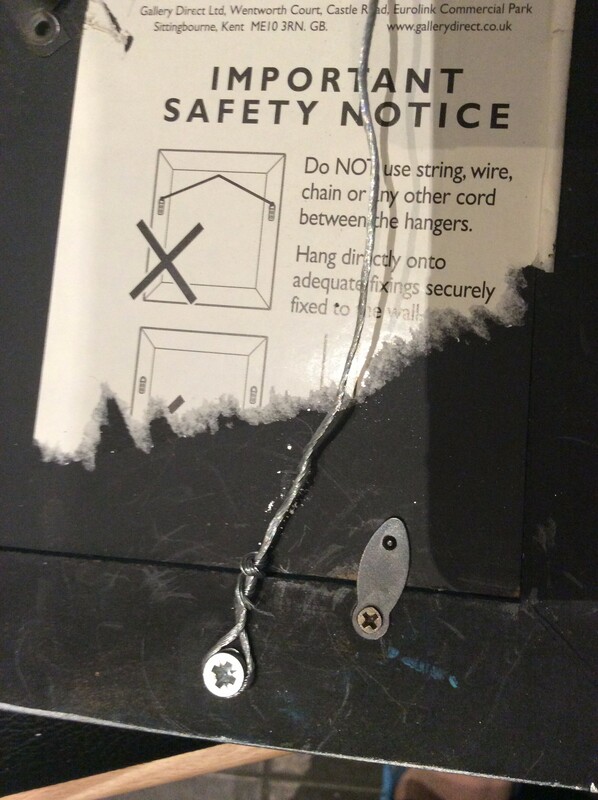 Please note that as is the tradition of my people, I completely disregarded the safety instructions on the back of the large frame. Safety Third! I’m pleased with the results and happy to have my students’ work hanging in the gallery. Viviane is impressed with my efforts as well, apparently. Meanwhile, I was also working on the Halloween projects. 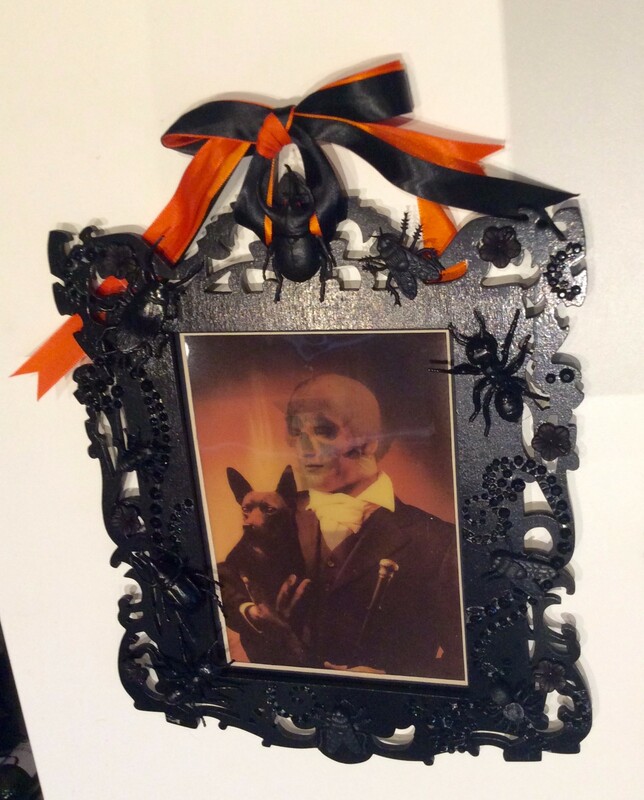 For the frames, I used the last of the laser-cut wood frames I bought at Michael’s a couple years ago. I had painted them black in Oakland, so I just needed to add some black bugs and some of these pre-formed glass rhinestone motifs. 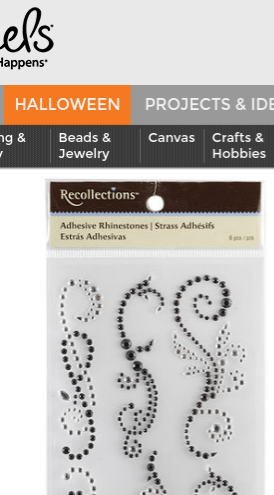 I find these “rhinestone flourishes” useful for Extreme Crafting situations, where you have multiple projects going and need to bust out some finished projects tonight. I cut the designs up and move them around as needed, and supplement with actual glass hotfix rhinestones from my stash to finish the details. I also take a brush and quickly paint black over the most obvious areas of the vinyl adhesive strip that the crystal “flourish” is on. 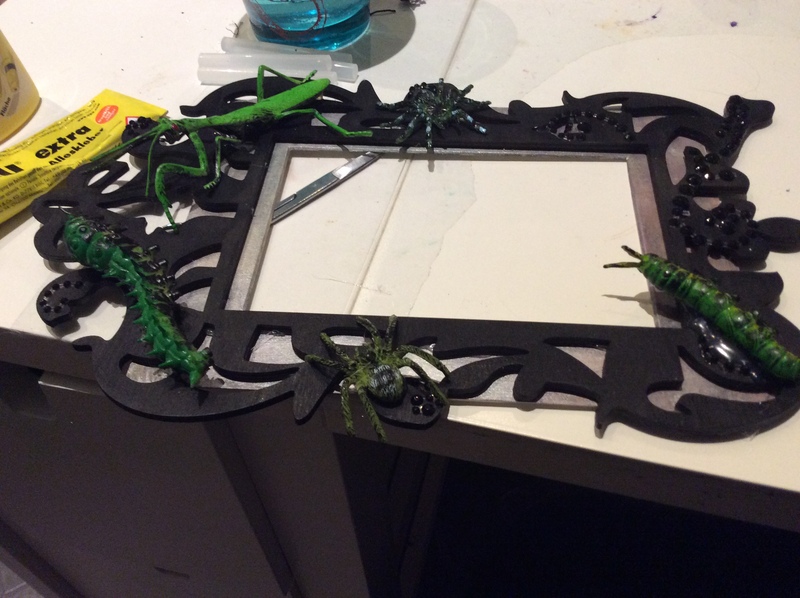 The greenish bugs had white undersides, so I dry-brushed them with black at the same time to help them integrate into the frame. I painted the whole green bug frame with multiple coats of Plaid FolkArt “Extreme Glitter” (hey, that’s what it’s called) transparent acrylic glaze with glitter. 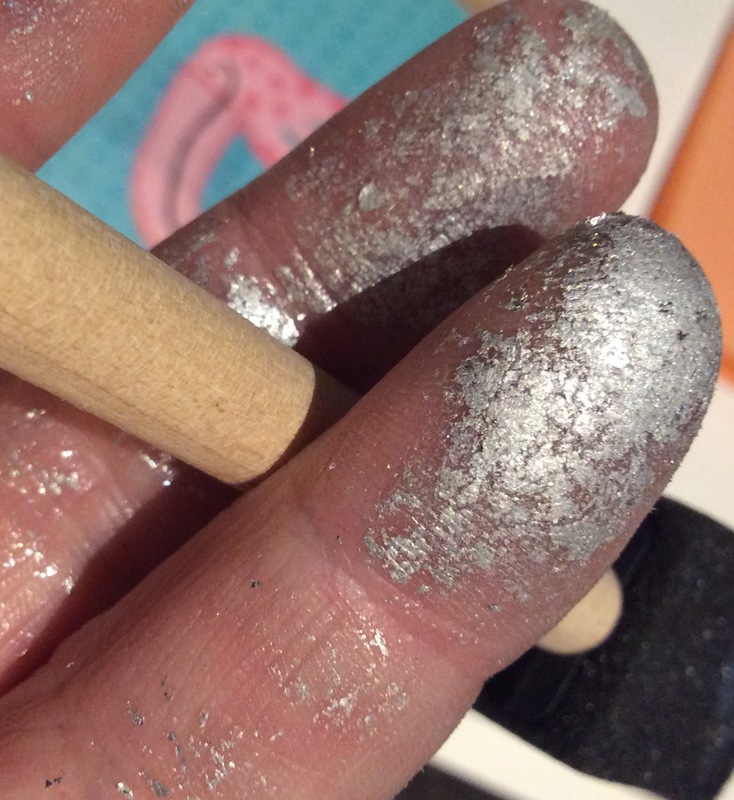 I’m not generally a fan of the “craft” acrylic paints that come in bottles for anything, but I make an exception for sheer glitter, metallic or pearl glazes. They go on very smoothly, they’re buildable and the tough, rubbery finish stands up to household use. If I could paint my hair with them, I would. 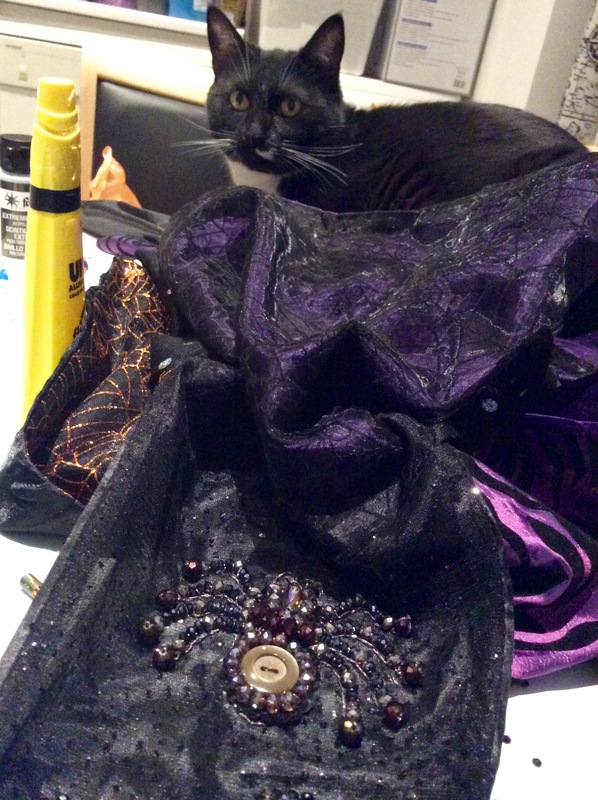 Next month’s bricolage roundup will be all Halloween, all the time- I’m working on half a dozen other Halloween projects besides the beaded mantel scarf I’ll post tomorrow. 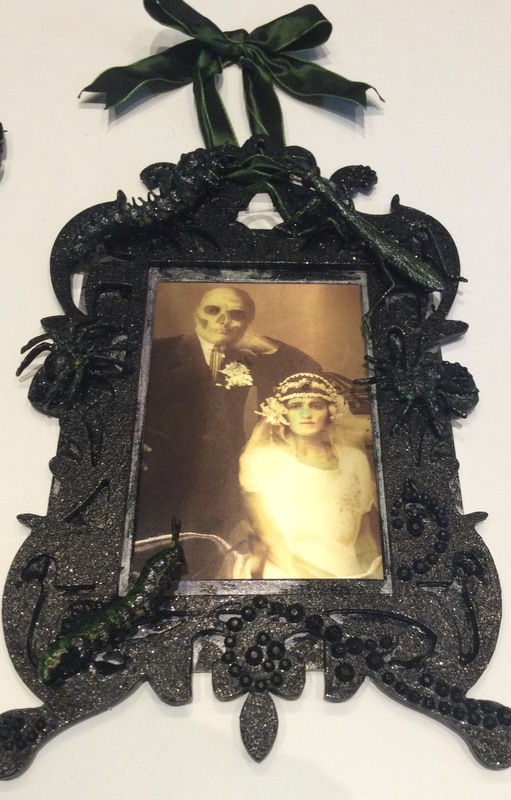 This entry was posted in Embroidery &Mixed Media Art, My art and tagged DIY Halloween, DIY silver leaf, gothic decor, gothic halloween, gothic home decor, gothic rococo, gothic rococo decorating, mixed media insect, Plaid Extreme Glitter paint, portrait drawing, Suzanne Forbes art, Suzanne Forbes artist on September 30, 2016 by Suzanne Forbes. Painting, or not painting, Ian in Berlin. I am very new to using watercolors. That means I sometimes makes mistakes, and with a watercolor you can quickly reach a point of no return. One of our friends from the Bay Area, a very handsome and dashing fellow, was in town. I was super excited to paint him, as I’d never had a chance in Oakland. He came over, dressed in a sharp suit, and I gave him some wine (we still have tons left from the housewarming) and set to work. He posed extremely well, with great brio, but I couldn’t get a light source that worked. And once I started painting, the situation devolved. 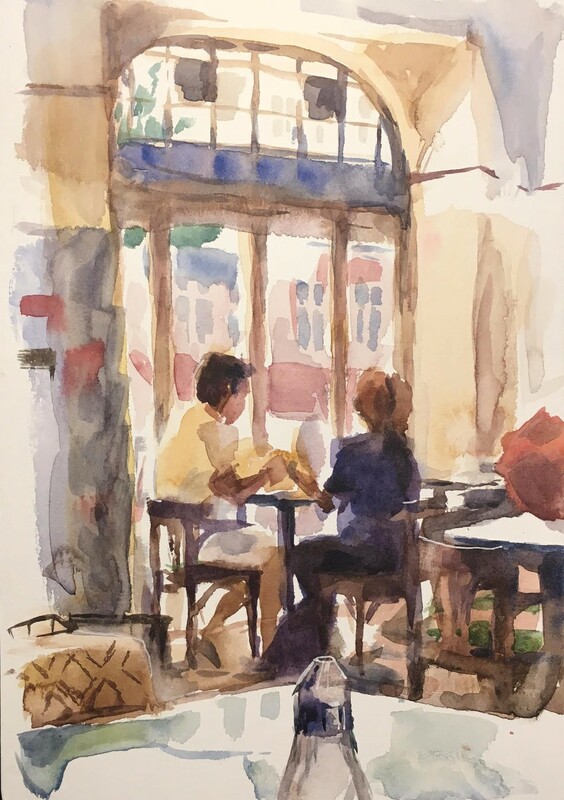 I can draw myself or paint myself out of just about any corner in an additive-subtractive medium; my knowledge of anatomy, structure and values is sufficient to recover from most wrong directions. But with watercolor, you can’t go very far down the wrong road. I tried everything I could think of to resolve the portrait, including opaque white to recover lost lights, but it was a no-go. Eventually I called it and we started over. I asked my model to change his pose, I changed the light source, and I switched to drawing, only lightly tinted at the end with watercolor. I captured his Leyendecker profile this time. 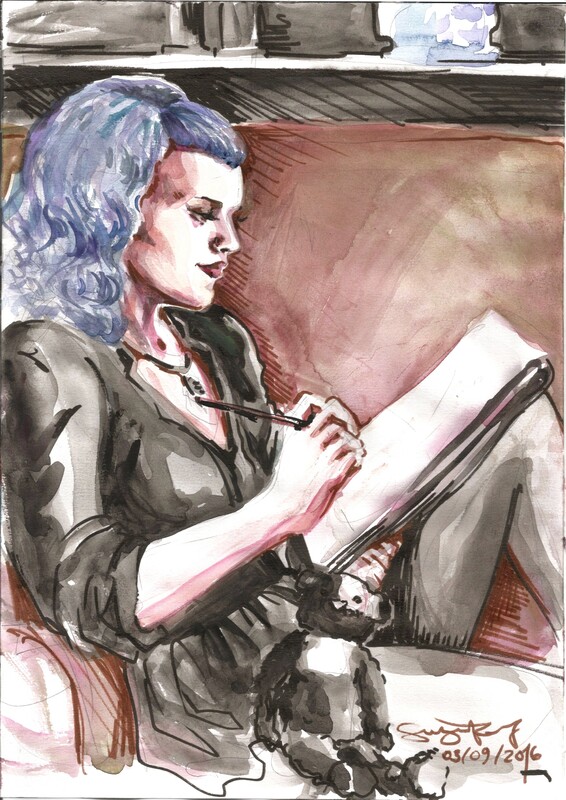 This entry was posted in My art and tagged art fail, art in berlin, artfail, drawing in berlin, life drawing Berlin., live drawing, portrait drawing, portrait painting, portraiture, Suzanne Forbes, Suzanne Forbes art, Suzanne Forbes artist, traditional portraiture for alternative lifestyles, watercolor portrait on September 26, 2016 by Suzanne Forbes. My very best wedding drawings yet! We went to America for a family wedding, and I made wedding drawings. Which is always a joy! As my health and well-being has increased here in Berlin, so have my drawing skills. These are some of the best, most warmly human likenesses I’ve achieved. I’m so grateful to continue recovering my health and to be able to make work at events like this one. 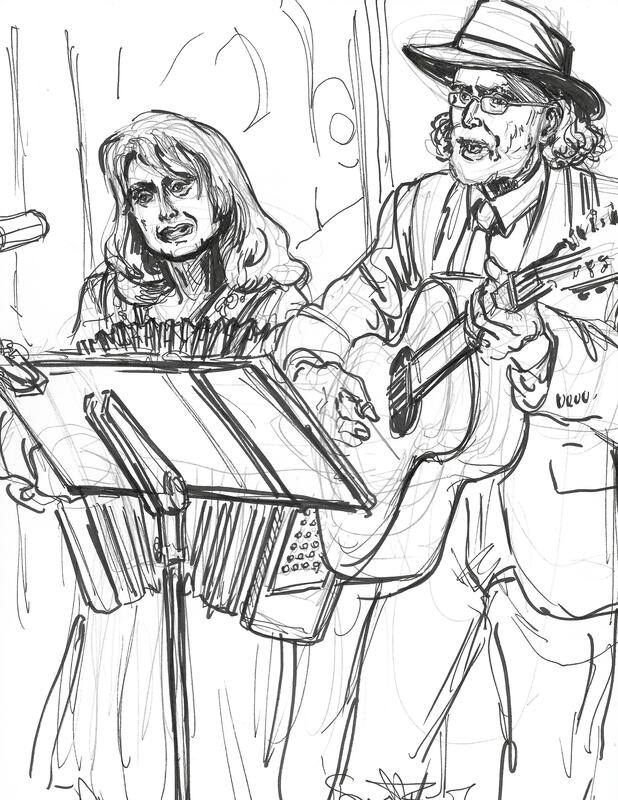 A wedding is as high-pressure an event as my old work as a courtroom artist was- you only get one shot! These folks performing are Madison, Wisconsin folk artists Lou and Peter Berryman, who actually wrote a song for the bride and groom; it was delightful! 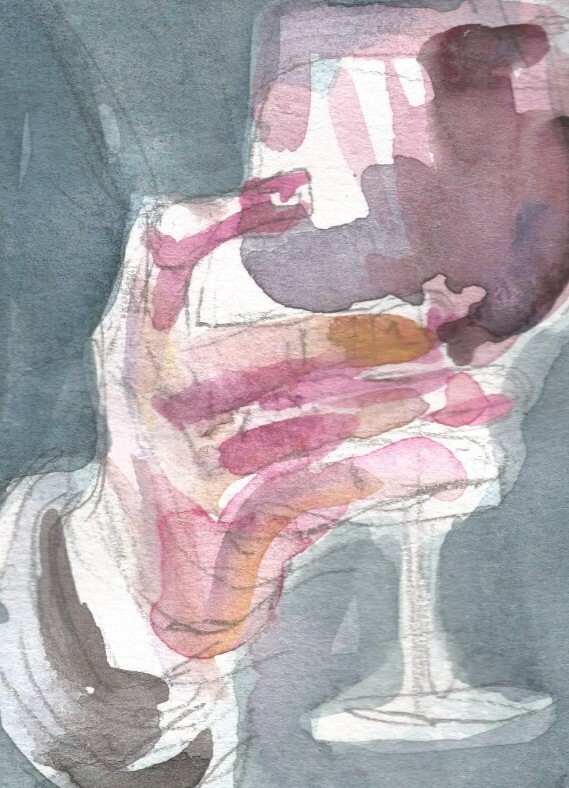 Here are some of my previous wedding drawings and a post-wedding couple portrait. If you’d like to support my work as an artist and art teacher you can visit my Patreon page! 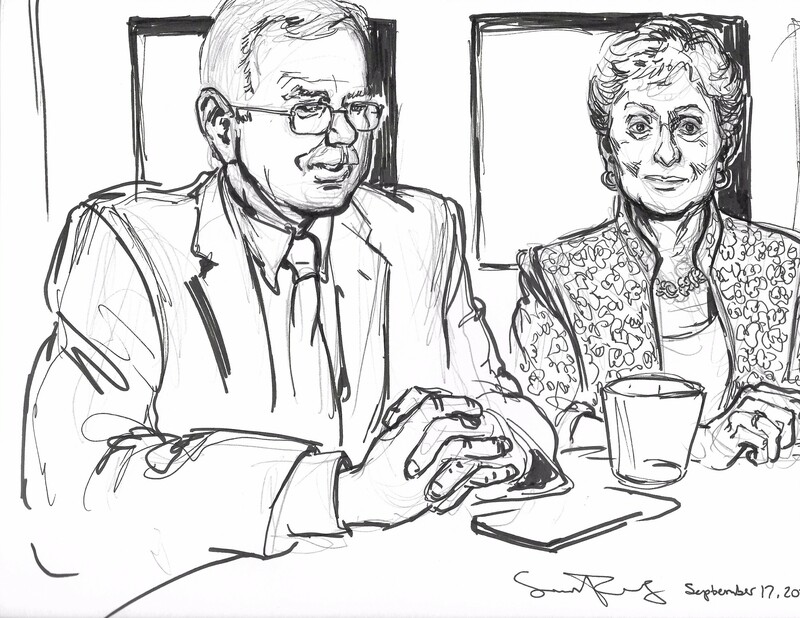 This entry was posted in My art and tagged drawing, live drawing, live event drawing, Lou and Peter Berryman, portrait drawing, portraiture, Suzanne Forbes, Suzanne Forbes art, Suzanne Forbes artist, wedding drawing on September 22, 2016 by Suzanne Forbes. Mother, Maiden, Crone- the Ages of Woman at a Berlin bus stop. This is one of those lovely Berlin scenes I just got a quick look at. 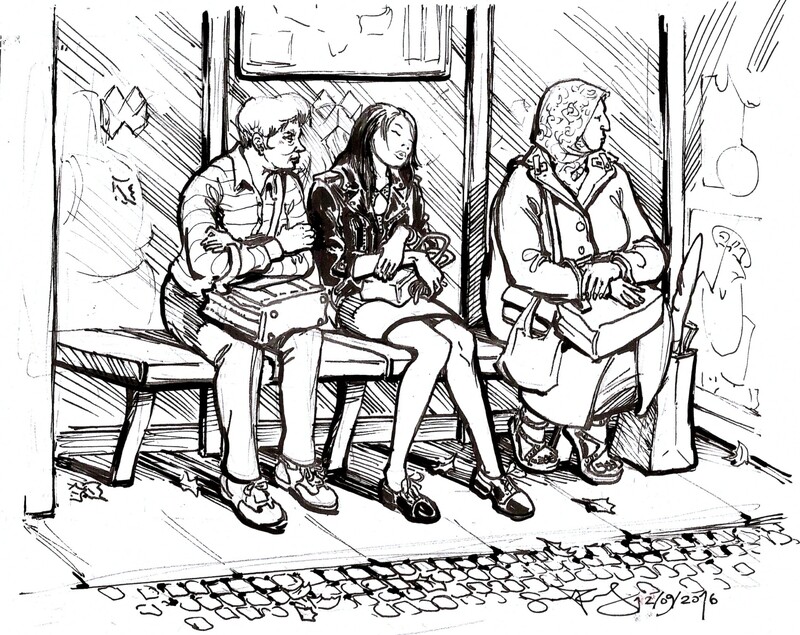 Luckily, I had my mini sketchbook with me AND two of the women got on the bus with me, enabling me to get more details of their clothes. It was a Sunday afternoon in the West. The conked-out girl in the leather jacket was obviously walk-of-faming it back from a club night (in Berlin you wear sensible shoes to the club, not heels. I had to wake her up and tell her the bus was arriving, which she appreciated!). I worked on the drawing over a couple of days and when I showed it to Daria she said it needed more space, the ladies needed to breathe. She was absolutely right, of course. She also suggested I push the characters a little more- make the older German lady even more grouchy and vigilant, make the Muslim lady more clearly heading home to her family. So I photocopied it onto an A4 sheet and finished the details at the expanded size. 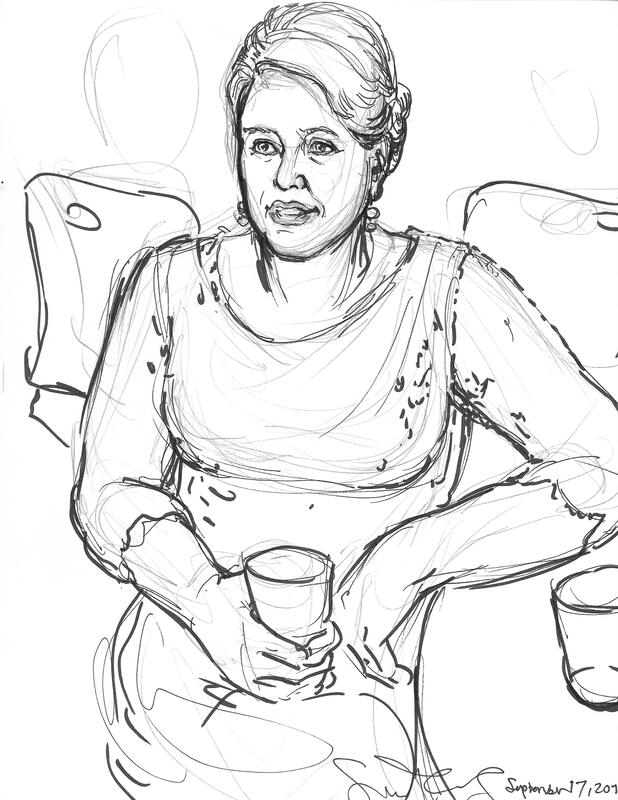 I added a grocery bag beside the “Mother” lady, with a baguette to represent grain and Demeter. I enhanced the frown of the “Crone”, who was really quite pissed off about the bus running late. And I added more leaves, to represent the cycle of life and Persephone. 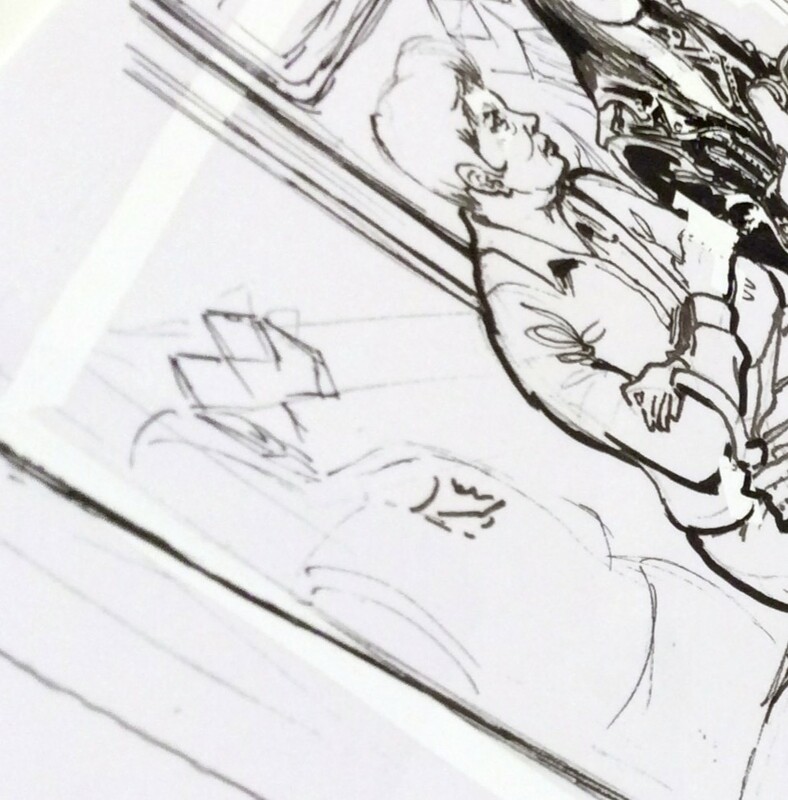 When I copy an ink drawing I often take advantage of the opportunity to make any corrections with white-out tape, as you can see here. I redrew the Crone’s right hand so her fingers popped more against the black of the Maiden’s jacket. I also used the white-out tape to eliminate the edges from the copying; the white line is where the drawing originally ended. Sure, I could use Photoshop, but this is way faster than trying to launch any kind of photo-editing program on my poor little Chromebook! 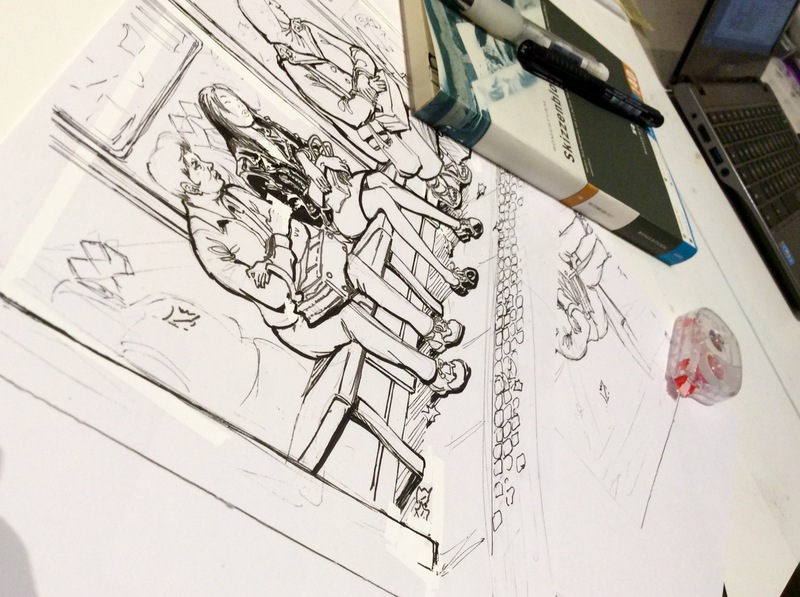 This entry was posted in Berlin, My art and tagged "Glücklich in Berlin", art in berlin, Berlin, Berlin drawing, Daria Rhein, drawing in berlin, life drawing Berlin., live drawing, Suzanne Forbes, Suzanne Forbes art, Suzanne Forbes artist on September 12, 2016 by Suzanne Forbes. Watercolor painting with Daria in Schöneberg! It’s our neighbor neighborhood, just to the East and a quick bus or subway ride. Blixa Bargeld, Marlene Dietrich and Helmut Newton were all born there. Bowie, Iggy Pop, Klaus Kinski and Christopher Isherwood lived there. It’s old-fashioned and not uptight, with lots of amazing food and lots of relaxed mature bears. 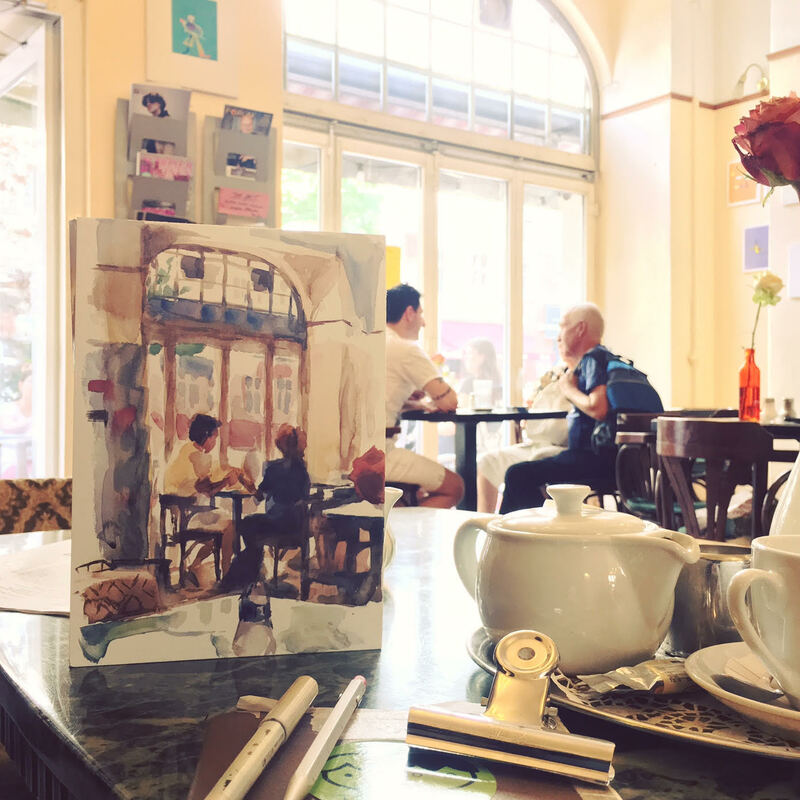 Daria decided the Cafe BilderBuch, or Storybook Cafe, is the perfect meetup place for us because it’s halfway between her place in Neukölln and our place in Wilmersdorf. We met there for the second time yesterday. I love to walk from the M29 stop at Nollendorfplatz, through the ancestral queer neighborhood and down towards the new hip specialty food joints. Daria made this beautiful watercolor. We went to Jones Ice Cream first, because Jones Ice Cream is beyond belief incredibly delicious. The ice cream is American style, with big, soft chewy American cookies also available. This time I had lemon ice cream with blueberry jam and lemon-mint sorbet. The day before I had cucumber and tonic and pink grapefruit/Earl Grey. All are amazing, although the cucumber and tonic is some particularly next level business. Here’s another pic of her Bilderbuch picture. You can see more of her work at her site and now secret works at her brand-new Patreon! This entry was posted in Berlin, My art and tagged "Glücklich in Berlin", art in berlin, Berlin drawing, Daria Rhein, drawing, drawing in berlin, Jones Ice Cream, Jones Ice Cream Berlin, life drawing Berlin., live drawing, portrait drawing, portrait painting, Suzanne Forbes art, Suzanne Forbes artist, traditional portraiture for alternative lifestyles, watercolor portrait on September 7, 2016 by Suzanne Forbes. 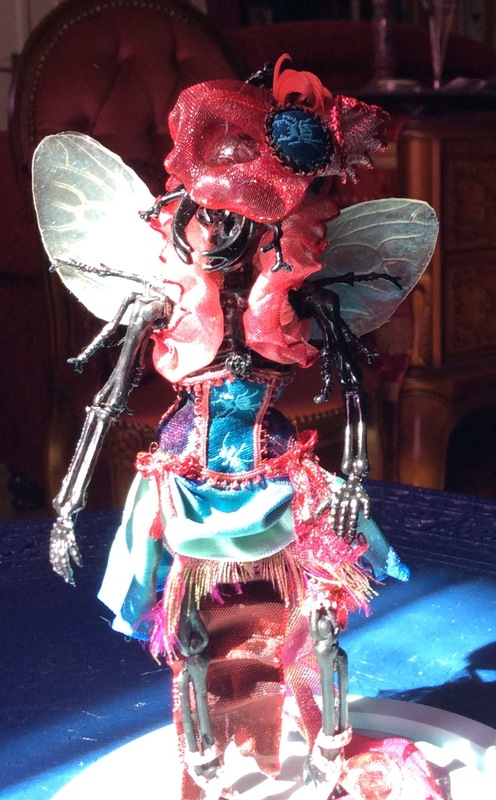 Horribella Mark V, a hideous Gothic-Rococo Dolly! I had absolutely no intention of making another Horribella at 8pm last night. 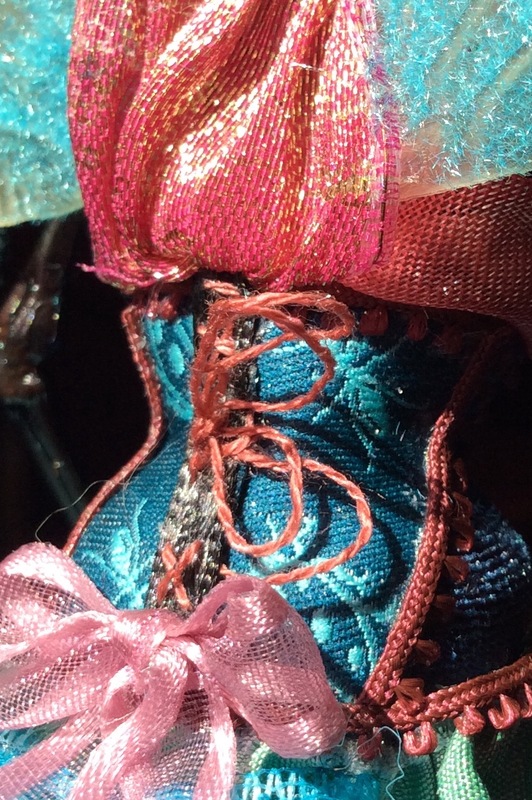 I particularly had no intention of using a single strand of embroidery floss to make tiny corset laces and tying tiny bunny loops with it, because I hate tying the tiny bunny loops. I went out the door for a night walk, and wandered a few blocks to the main shopping plaza. I “accidentally” stopped in at TKMaxx to check out the Halloween stuff. There wasn’t much Halloween stuff (they get a little because they share inventory with the US TJ Maxx stores) but I saw this display cloche- with the base already painted blue. I had an instant vision of a Gothic Rococo Horribella. The last one lives in the library, because she matches the colors in there; I suddenly wanted one for the salon! I bought the cloche and a foot massager for the hubbin and hurried home. Then I spent the next ten hours working nonstop like a fiend on the new dolly. Even though I’ve been teaching, drawing, painting, embroidering and writing all month. I was so excited I never even took off my bra when I got home. Normally my front door is an Instant Bra Removal Field. Making these dollies demands a kind of flow state where I grab things and glue things and melt things without stopping to think. If I stop to think, I remember I have virtually no training in mixed media or sculpture and never intended to make this kind of art. So I don’t stop. 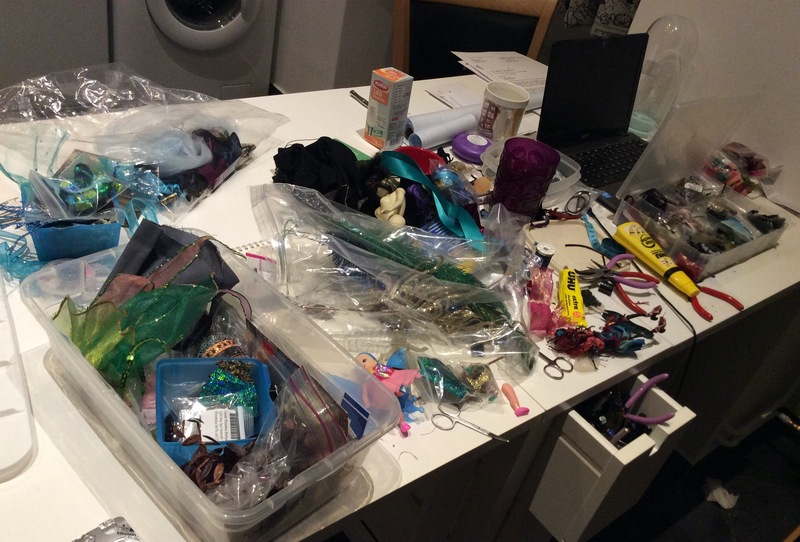 During the year of packing for the move, I had episodes where I managed my stress by meticulously, dementedly organizing every scrap of craft supplies I own. It was not an efficient use of my time, but it kept me sane. I had a vision of using all this stuff, in Berlin. That meant when my workshop was finished, all I had to do was pop all the neatly bagged/sorted/labelled supplies into the drawers, and I now know where everything is. 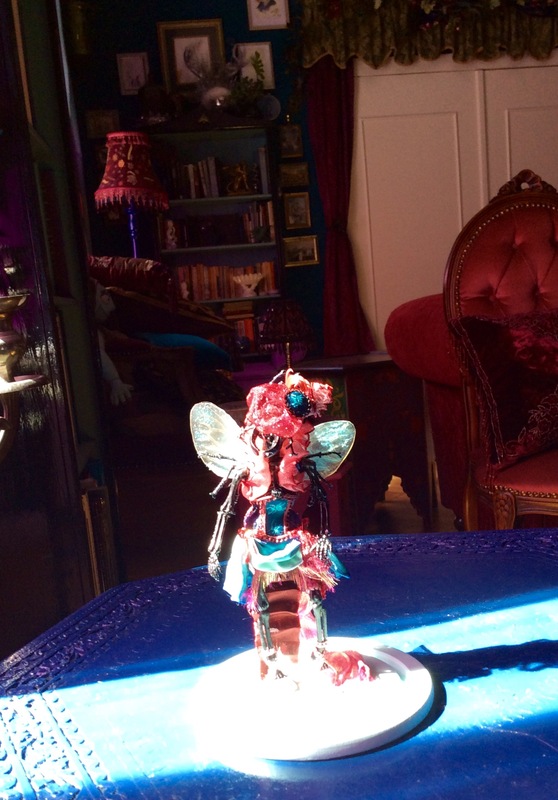 My workshop is a decent imitation of the greatest art & crafts workshop I know, that of my friend Monique Motil. I’m busting through projects and finally, finally using things I have had for years. Decades. I used four different scraps of wired pink French ribbon on this dolly, and two of them dated back to the craft projects for my first marriage. These scraps of ribbon have moved from St. Paul to Hartford to DC to Arlington to Alameda to Albany to Berkeley to North Berkeley to Albany to Oakland to Berlin. They have been in storage three times. I’ve had fifteen apartments, dozens of jobs, and three husbands. You know what’s fantastic about getting older, being happy and feeling safe? You can finally say, if not now, when? If not me, who? There will never be a better project to use any of these things on than the one in front of me right now. Every piece of ribbon from a present I carefully saved, every pair of feet I cut off a plastic monster or pair of wings I cut off a plastic bug- all of this stuff is going in the hopper. I used a satin-covered button from a silk nightshirt I owned in 1992 to make the base of this Horribella’s hat. 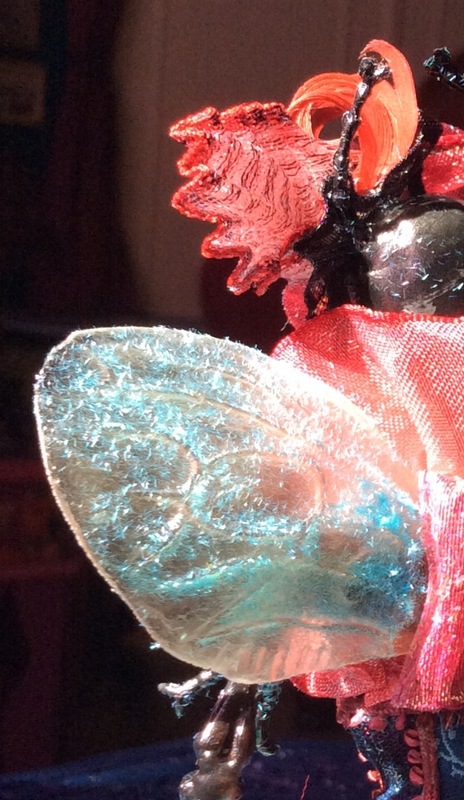 It took four tries, four little pieces of embroidered stag beetle ribbon used up, to get it to look right. Don’t care! 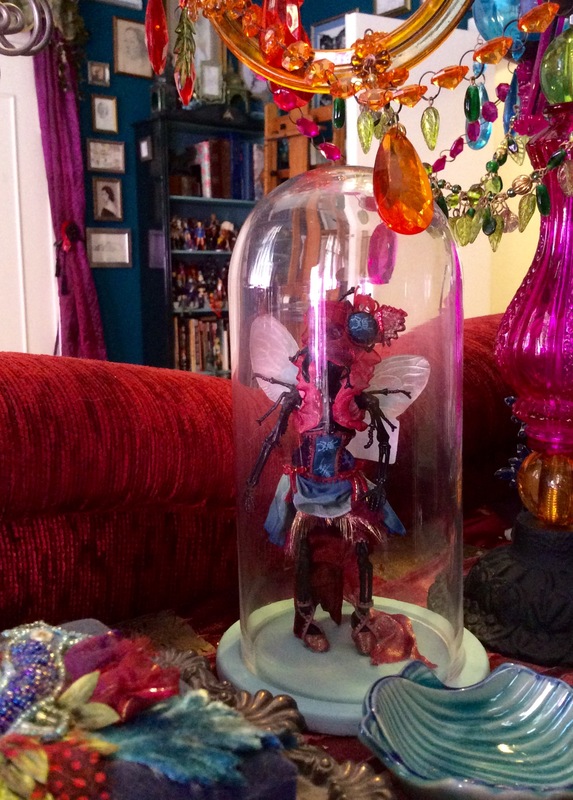 It’s my weird stuff and my weird lifelong decorator crab shell of crap, I’m gonna use it all! I used eleven different ribbons/trims, four adhesives, epoxy clay, primer, spray paint, plastic toys, nail flocking powder and parts of three plastic bugs to make her, and I think she is the best Horribella yet. She is truly a Horrible Dolly. I am going to make all the horrible things. I didn’t just make a new Horribella last night. 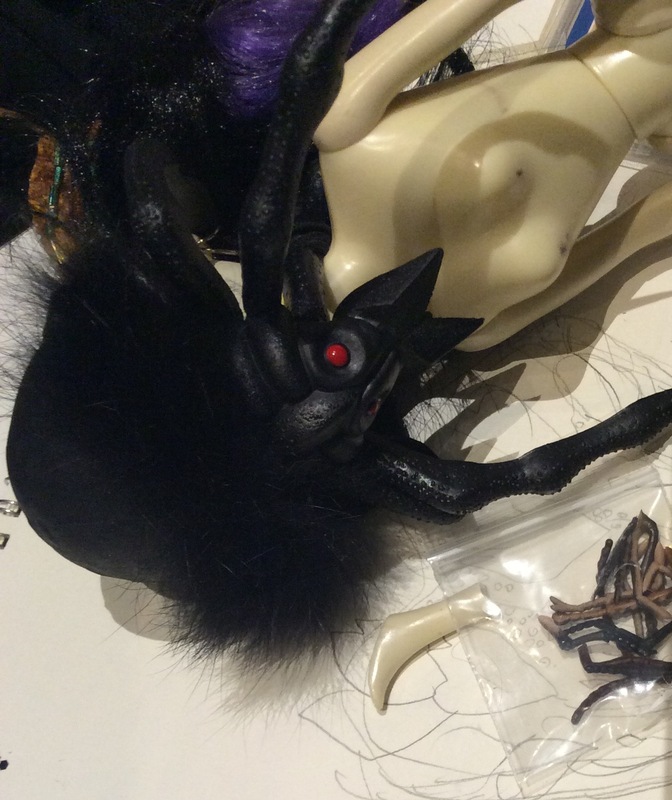 I also started a hideous Spider Lady with monster feet. She is going to be truly dreadful. I have lots of tutorials to study on my dollmaking Pinboard! 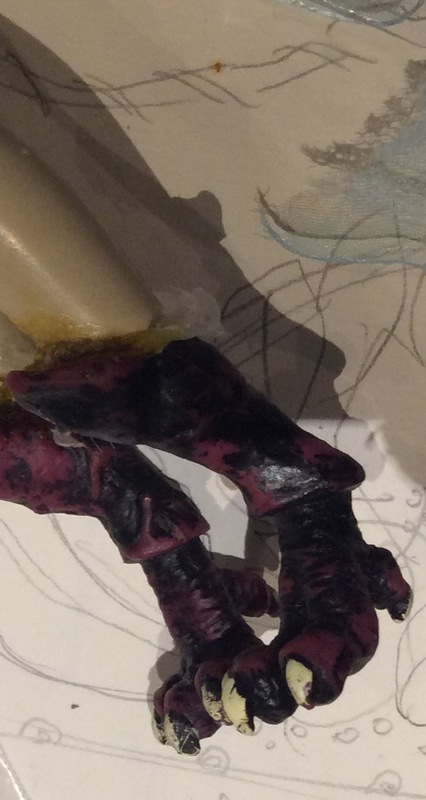 Look for continued unpleasant doll developments this September. 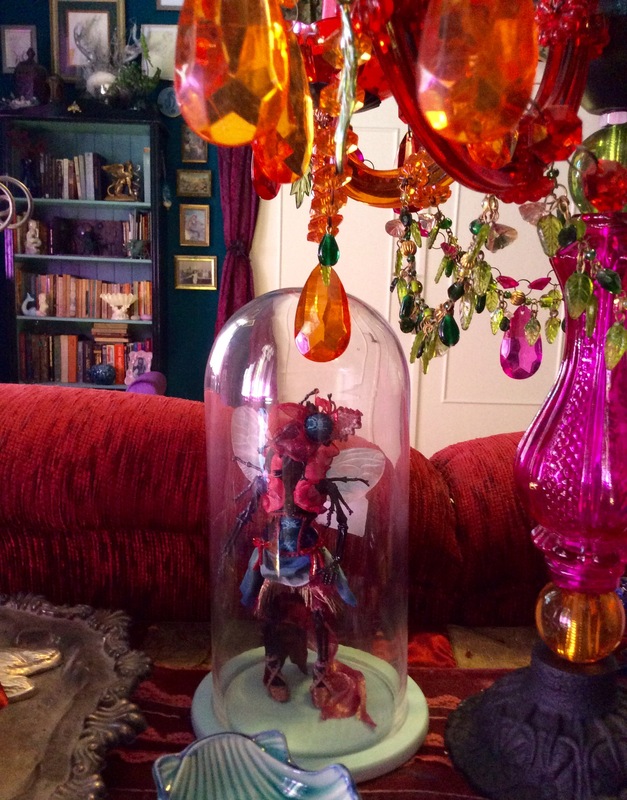 As always, when I make a doll I am deeply indebted to the incredible inspiration of Monique, creator of the incomparably creepy and beautiful Sartorial Creatures. This entry was posted in Dollhouse and Dollmaking, Embroidery &Mixed Media Art, My art and tagged "Glücklich in Berlin", art in berlin, bricolage, contemporary crafts, creepy doll, DIY, dollmaking, gothic rococo, handmade doll, insect doll, miniature corset, mixed media insect, mixed media sculpture, OOAK, scary doll, Suzanne Forbes, Suzanne Forbes art, Suzanne Forbes artist, tiny corset, tiny corset for doll on September 1, 2016 by Suzanne Forbes.